Toddler Sleep Question: My 3.5 year old is in my bed and my husband is on the couch! Toddler Sleep Question: My Husband is Sleeping on the Couch and My 3.5 year Old is Sleeping in MY Bed! Lots of good questions within your question! I agree that switching your daughter from the day bed to a “big girl bed” will not fix the problem if she does not know how to put herself to sleep independently and if you don’t address her wakings consistently. If your daughter does not know how to put herself to sleep without a sleep crutch (such as lying down with her, rubbing her back to sleep etc.) then I would start there with the Sleep Lady Shuffle as outlined in Chapter 11 of my book “The Sleep Lady’s Good Night Sleep Tight”. Remember to have an early enough bedtime (which may help reduce nightmares). A 3 year old needs on average 10.5 hrs at night and 1.5 hrs during the day. A 4 year needs 11.5 hours at night. Do the math backwards….if she tends to wake for the day around 7am then she needs to be asleep between 7:30-8:30pm depending on whether she naps or not. The second and critical step is to create a plan with your husband on how you wish to address her night wakings. If you no longer wish to co-sleep with her during the night then it is important that you stand firm on this decision and follow thru consistently. Once you have a sleep coaching plan in place, it’s absolutely crucial to be consistent—even in the middle of the night when you’re tired and not thinking clearly. Sending mixed messages—which behavioral scientists call “intermittent reinforcement”—to your child throughout the day (and night!) will only frustrate her. She won’t be able to decipher what type of behavior merits rewards and what type of behavior doesn’t. Inconsistently reinforced behavior is the hardest type of behavior to modify or extinguish. It takes longer to change and it always gets worse before it gets better. This is particularly true of a child who’s more than 1 year old. Therefore once you get started, don’t give up! Review Chapter 11 (or get my Workbook), create your plan including a sleep manner chart and have a family meeting. Tell your daughter that there is no more sleeping in mommy and daddy’s bed but when she wakes up you will stay with her as she learns to put herself to sleep. Follow the Shuffle for older children as outlined in my book, making sure to move every three days so you don’t get stuck in her room as the new sleep crutch! 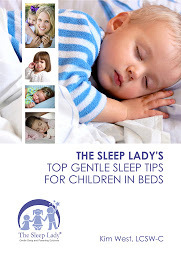 To read more about how to sleep coach your toddler read this older blog post. Don’t start sleep coaching until you and your husband are both on the same page and 100% “in”! To buy Good Night Sleep Tight as part of the DIY Package NOW click here.